Please note: The digital edition does not include 2 of the 62 images that appear in the physical edition. On Melbenan Drive just west of Atlanta, sunlight falls onto a long row of well-kept lawns. Two dozen homes line the street; behind them wooden decks and living-room windows open onto vast woodland properties. Residents returning from their jobs steer SUVs into long driveways and emerge from their automobiles. They walk to the front doors of their houses past sculptured bushes and flowers in bloom. For most people, this cozy image of suburbia does not immediately evoke images of African Americans. But as this pioneering work demonstrates, the suburbs have provided a home to black residents in increasing numbers for the past hundred years—in the last two decades alone, the numbers have nearly doubled to just under twelve million. Places of Their Own begins a hundred years ago, painting an austere portrait of the conditions that early black residents found in isolated, poor suburbs. Andrew Wiese insists, however, that they moved there by choice, withstanding racism and poverty through efforts to shape the landscape to their own needs. Turning then to the 1950s, Wiese illuminates key differences between black suburbanization in the North and South. He considers how African Americans in the South bargained for separate areas where they could develop their own neighborhoods, while many of their northern counterparts transgressed racial boundaries, settling in historically white communities. Ultimately, Wiese explores how the civil rights movement emboldened black families to purchase homes in the suburbs with increased vigor, and how the passage of civil rights legislation helped pave the way for today’s black middle class. Tracing the precise contours of black migration to the suburbs over the course of the whole last century and across the entire United States, Places of Their Own will be a foundational book for anyone interested in the African American experience or the role of race and class in the making of America’s suburbs. History from the Urban History Association. "Numerous authors have detailed the phenomenon of black suburbanization in the 20th century surrounding specific U.S. cities, but Wiese is one of the few to consider the overall trend, particularly comparing migration in the North and the South. Wiese argues that instead of being forced from the cities, blacks moved into the suburbs by choice in order to build their own communities. His discussion of Southern suburbanization is especially interesting, partly because earlier studies have focused on Northern cities and partly because Wiese sees suburbanization as an extension of the Civil Rights Movement’s impetus toward black empowerment.... Wiese does a good job of covering his topic from both black and white perspectives. 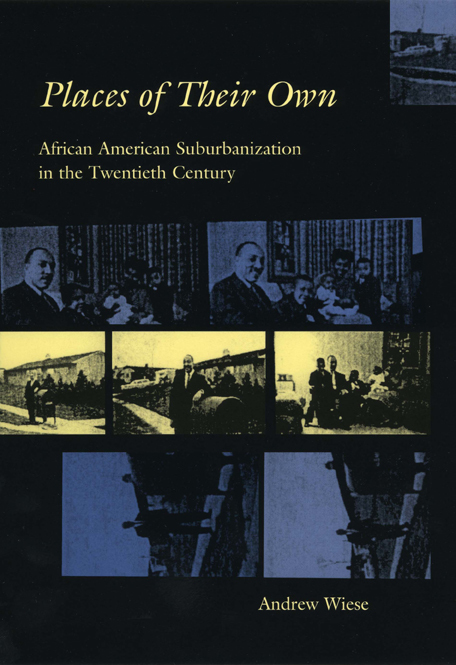 A useful addition to the literature of black suburbanization." "A work of exceptionally broad research, Places of Their Own does much more than simply document the presence of African Americans in suburbs. It also illustrates how black suburbanization changed over the course of the twentieth century." "Wiese has provided an insightful reference work on black suburbanization that will influence the field and encourage new research. His informative maps, tables, and photographs further reinforce what is now the best scholarly treatment of an important subject."